TALL SLEEK VINTAGE ITALIAN MURANO PINK & BLUE CASED ART GLASS VASE MID CENTURY. EXQUISITE EXAMPLE OF QUALITY VINTAGE ITALIAN MURANO ART GLASS. Proudly presenting a stunning vintage Italian Murano art glass vase. This exquisite piece was expertly hand crafted by a Master Italian glass artist circa 1950s. This exquisite piece has been spectacularly coloured with a radiant mix of rich blue and vibrant pink. The colours spectacularly radiate throughout the tall, sleek form, blending to create a range of vibrant combinations including stunning purple tones. The colours are suspended sommerso style within the sparkling clear glass, forming a radiant arc of colour within the clear glass base. The glass has been expertly tooled to form thick lobes, with radiate from each tip of the star shaped base travelling vertically up the sleek body to the peaks forming the top rim. The encased colours glow with a magical intensity as they reflect off the thick lobes and stylish curves. This stunning piece looks amazing with light passing through the glass, magnificently intensifying the radiant colours and casting vibrant reflections. This piece is presented in excellent vintage condition with no chips, cracks or repairs. There are some exceptionally minute fleabite sized nibbles around the edge of the quality flat ground base, noticeable only on extremely close examination but mnetioned for complete accuracy. This exquisite piece has been very well cared for and presents spectacularly. This impressive piece stands approx 320mms tall and measures 105mms in diameter at the base. This superb piece would make an outstanding addition to any quality vintage Italian Murano art glass collection. The timeless style and elegance of this exquisite vase ensures it would make a stunning feature in any well designed home. A perfect gift idea for any discerning admirer of fine quality, hand crafted vintage objects of sheer beauty. International buyers are most welcome. Sorry, no personal cheques accepted. All items are professionally packaged using quality materials. We individually hand select quality vintage, antique, well designed and hand crafted pre-loved items, and proudly offer our finds for sale. We aim to describe and visually represent our items as accurately as possible. 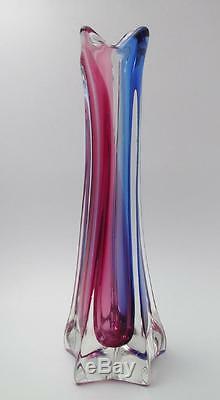 The item "TALL SLEEK VINTAGE ITALIAN MURANO PINK & BLUE CASED ART GLASS VASE MID CENTURY" is in sale since Thursday, July 09, 2015. This item is in the category "Pottery, Glass\Glass\Art Glass\Italian". The seller is "threetreefrogs" and is located in Melbourne, Victoria.